Loads of replay value, fun characters, and so very collectable. Your kids will want them all, every single one. 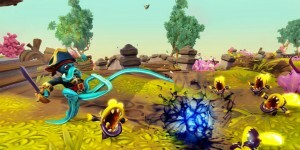 Skylanders SwapForce is an outstanding addition to what has been a superbly done series. With a host of diverse characters that are loads of fun to collect, a story line designed to capture and hold imaginations right from the start, and so much replay value, you’d be hard pressed to find another kids’ game that has so much to offer. Aahhh, Skylanders. It has won the hearts of many, young and old. But does the newest release, SwapForce, really bring anything new to the table, or is it just more of the same? When I first heard the concept for Skylanders (the original), Pokemon was what originally sprang to mind. As a parent, a game with infinite collecting possibilities can be both good and bad. On the one hand, kids love collecting things, and a super fan is pretty much a slam dunk to buy gifts for, any time. On the other hand, whether there are 20, or 80, or 856 characters available, your kid is going to want them all. So, I was a little skeptical that it was anything other than a blatant attempt to separate parents from their hard earned cash with a game that ensures you’ll just keep on buying. That may well be the business goal with Skylanders (companies do have to earn a profit), but it is definitely done with a gamer’s enjoyment at the forefront, and that makes all the difference in my book. 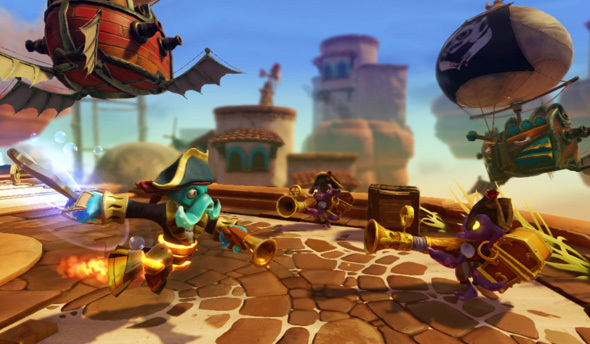 The Skylanders franchise presents a game that can be all things. First off, they’re great action figures, and they even come with collectable trading cards, for offline fun. The characters save their leveling up progress right to the toy, and kids can drag them along to play with friends and family without losing any progress, regardless of platform. 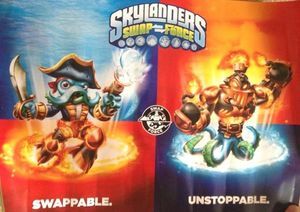 Skylanders SwapForce is the third entry in the series, and to be honest, I was a little skeptical that they could really bring anything completely new to the table. The first two games, Spyro’s Adventure and Giants, were both really enjoyable games, even from the standpoint of an adult, and Activision has given itself a really high standard to live up to. Fans will be happy to hear that they have done so splendidly with the newest game (and just in time for the holidays, too). The biggest addition is obviously the new characters. As the story goes, the SwapForce Skyalnders were guardians to a magical volcano in Skylands. 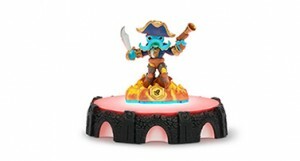 When said volcano erupted midbattle, the Skylanders earned the ability to swap powers. How does it work? Really well, actually. You won’t find any interlocking joints that are tough for little fingers, or easily breakable parts (a real plus for the really young fans). Instead, the SwapForce figures use magnets. They easily pop apart, and just as easily join together with other SwapForce figures, and the joint isn’t even noticeable. When two pieces are joined together, they form an entirely new Skylander when placed on the Portal of Power (which is more compact this time, but still wired). For instance, Wash Buckler and Blast Zone can join to create both Wash Zone and Blast Buckler, depending on how you join the pieces. They are as imaginative and well made as you’d expect from Skylanders figures, and a really fun addition to the game. Figures that combine is cool and all, but if any of you play Skylanders, you’re probably already wondering how leveling up and upgrading will work. Does the new character created when you join its pieces upgrade on its own? Do both characters level up? It’s a combination of both, and I really liked the way it’s done. Leveling up and coin collecting stays with specific characters, but this time even the player gets to level up with Portal Master points. Upgrading offers more options than ever before as well. Since the SwapForce characters have two separate pieces – top and bottom – upgrading is separated, creating even more paths for you to choose for your characters. Every time you select an upgrade for a SwapForce, you choose to upgrade the top or the bottom, with separate abilities and paths available. Whatever upgrades you buy stay with the piece – so Swash Buckler’s new tentacle abilities stay with his bottom half, no matter which Skylander he is joined with. So the new characters are great, but what about the game? It’s also a combination of old and new, with a well done blend of keeping what works while adding something new. There is still a ton of exploring to be had, with hidden treasures, hats, and story scrolls to be found all throughout the game. While you can definitely beat the game with just the characters that come with it (Blast Zone, Wash Buckler, and Ninja Stealth Elf), you will need a larger collection if you want to explore every path. As in previous iterations, there are many areas that can only be accessed by certain Skylander types, and SapForce continues that, but with the addition of dual element gates. These require a swapped Skylander that is possessed of a certain ability. You also still collect Soul Gems, which give you a preview of new Skylanders. While your kids (and likely you, too) will definitely want more figures to access these areas, or just because they look cool, the extra parts are never required to finish your journey. As a benefit, they do mean loads of replay value. All the hidden items, combined with special areas, makes this a game to come back to over and over again. The story is told out in cartoon like cutscenes that kids absolutely adore. This was done in the previous games as well, and it really captures their imagination. Yet again, players battle the evil Kaos, a diminutive super villain who is determined to take over Skylands. With his newest invention, the Evilizer, he can turn seemingly innocent creatures into formidable foes, and even the already evil characters can be made more so. His evil plot to Evilize the Elementals and thus the world (evilly) must be stopped, and only the Skylanders can pull it off, with a mix of supporting characters old and new to help them along the way. Skylanders SwapForce is a solid addition to what has been a superbly done series. With a host of diverse characters that are loads of fun to collect, a story line designed to capture and hold imaginations right from the start, and so much replay value, you’d be hard pressed to find another kids’ game that has so much to offer.